Home › Whiskey Still Company Blog › Blindness and Poisoning from Drinking Moonshine, Myth or Fact? Blindness and Poisoning from Drinking Moonshine, Myth or Fact? Prohibition, which was supposed to restrict the production, transportation and sale of liquors, ironically led Americans to produce homemade alcohol and rumrunners to smuggle forbidden substances. It was also the lawless decade of the 1920’s when bootlegging trade was in boomed operation. Illegally produced alcohol was termed Moonshine, or called “hooch” and is said to be the original “Mountain Dew”. It used a still to extract the alcohol. During the Prohibition, reported cases of poisoning and blindness spread among patrons of moonshine. 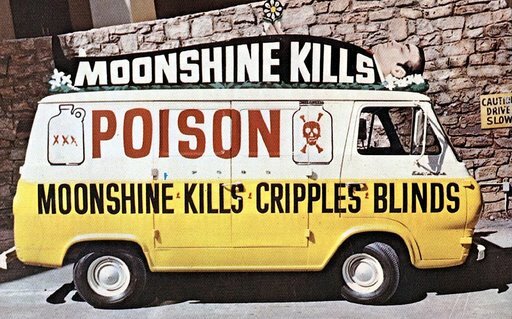 Methanol ingestion from drinking moonshine is long riddled to cause blindness. In the process of making alcohol, methanol is produced by fermenting grains or fruits high in pectin. When methanol is consumed, it changes into formaldehyde which can cause damages to the eyes and in severe cases blindness. This however could be avoided, the first few ounces that come out of the distiller, which contain the methanol, only need to be discarded. The fears of getting blind from drinking ‘shine are not founded, the false horrors about methanol in moonshine were only deepen because of some bootleggers who intentionally included antifreeze such as methanol to cut the alcohol so to earn more profit. Cases of poisoning happened due to early moonshiners who were less cautious in their production. Some bootleggers used car radiators that were lead-contaminated as condenser to distill alcohol. This adversely resulted to several incidents of lead poisoning during the 1920s. Fortunately, the modern day whiskey stills are assembled using lead-free solder to avoid potential health hazard. Mad bootlegger’s tales are things of the past. The Prohibition experiences became the grounds for creating better distilling practices of today. Modern day hobbyists make their own “hooch” following explicit safety guidelines. These set of instructions ensure that moonshine is safe for human consumption. When prepared properly, moonshine is as safe to drink as the spirits you buy in a store.